It is best to begin acupuncture and herbal treatments three months before the IVF cycle begins. This becomes especially important if there has been a previous unsuccessful IUI/ IVF cycle. If this is not possible, begin treatment as soon as possible in your IVF cycle. We work closely with local fertility clinics and are very familiar with the process and how acupuncture can increase your chances of a healthy pregnancy and child. Once you IVF cycle begins we use scientifically proven protocols to compliment each phase and maximize your success. We use choose your treatments based on your age, reproductive history, and reaction to your IVF protocols. Treatments are given 1-3 times a week per cycle. We recommend starting acupuncture weekly 3 months prior to the procedure. We highly advise a treatment within 4 hours of the transfer. Whether acupuncture is started three months prior to the beginning of an IVF cycle or one week prior to transfer, the focus on the treatments will be to improve the egg quality and increase blood flow to the uterus promoting the formation of a healthy uterine lining. Without a high quality egg it is impossible to have a high quality, viable embryo. Decreased blood flow to the uterus has been associated with high failure rates of IVF cycles. There have been numerous studies that have shown the increased success of a transfer when combined with acupuncture as soon as possible after the procedure. 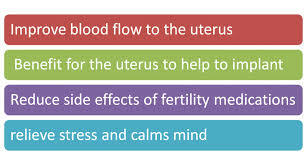 Acupuncture at this time is designed to assist in implantation of the embryo in the uterus. In 2001, a landmark study led by Wolfgang Paulus was published in Fertility and Sterility, which showed that acupuncture increased the clinical pregnancy rates of IVF. The results showed that 42.5% of the patients who received acupuncture became pregnant versus 26.5% who did not. Stress is often a factor associated with an assisted reproduction cycle. Acupuncture is very beneficial to reduce stress and anxiety and its effects on the body as well as decrease side effects from Western fertility medications used through an IVF cycle. Conception is just the first step toward the birth of a healthy child. After the transfer of the embryo the focus of treatment is on creating an optimal environment for the embryo. Assisted reproduction technologies have been associated with higher incidences of complications during pregnancy. We recommend acupuncture 1-2 times per week post transfer through the first trimester. The focus is to assist implantation and prevent miscarriage, moderate immunological factors, increase energy, and prevent pregnancy complications.